AISPORTS are specialize in the manufacture and sale of Smart Watch Band. To offer a good user experience for your smart watch strap. We strives to be a trusted partner and seek to achieve 100% in customer satisfaction. If our products meet your daily needs and make your life easier, perhaps modestly, it will be the highest honor of us. We wish you a happy life! 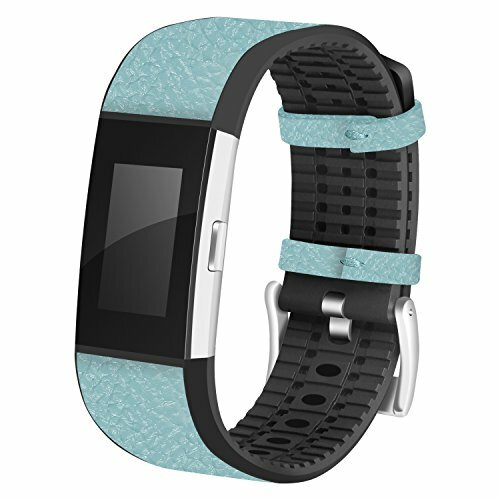 AISPORTS premium fashion vintage durable breathable leather soft TPU inner Fitbit Charge 2 strap with secure classic metal buckle clasp replacement band. ♥Made of premium leather, Skin-friendly, Lightweight, Comfortable, Fashionable design. It's the perfect gift for your friends or family member. ♥Multiple alternative holes and adjustable length to fit well for most wrist, Comparable to original Fitbit Charge 2 Band. ♥Exquisite durable clasp adopts stainless steel metal clasp buckle ensure the stability, easily to install / remove. The connectors adapter is sturdy enough for daily abrasion, without any worry that the adapters & screws fall apart easily. ♥Contracted design style, with you life contracted and not simple. Fit for Business, Casual, Party, Outdoor Activities, and Daily Life. 1x Fitbit Charge 2 Watch Band (The Smart Watch does not included). Warm Prompt: You can wait 8-25 days after ordering. Your patience is greatly appreciated. Please Note: Due to the difference between different monitors, the item picture will be have color differences. We guarantee the style is the same. Compatibility - Specially designed for Fitbit Charge 2 (The Smart Watch not included). The special craftsmanship suit the style of different color bands, which makes your Fitbit Charge 2 more exquisite and shows your unique taste in the meanwhile. Premium Materials & Craftsmanship - This fashionable durable watch band features high quality craftsmanship with a comfortable feeling of SOFT LEATHER & TPU Inner on your wrist. Includes anti-slip & sweat-absorbent & wear resistance & skin-friendly, you don't worry hurt your skin. Adjustable Band - This replacement Fitbit Charge 2 bands fit most people, no matter teenagers or the aged, men or women, Fit for most wrist. Fit for Business, Casual, Party, Outdoor Activities, and Daily Life. Solid Stainless Steel Buckle - Metal clasp made with hypoallergenic nickel free and stainless steel, An innovative pin-and-tuck closure ensures a clean fit, all material contain NO harmful substance. Suits some circumstances like outdoor sports or business. Easy to install and remove - Band comes with watch lugs adapter connector on both ends, which locks onto Fitbit Charge 2 Watch Band Interface precisely and securely. If you have any questions about this product by AnGolf, contact us by completing and submitting the form below. If you are looking for a specif part number, please include it with your message.